May 10, 2016 -- Assuming you have depleted the cache of tickets you purchased during the Great (and Still Unexplained) British Airways Giveaway last October, you'll want to know BA is back with another big sale. This latest flash offer is not nearly as phantasmagorical as October's fire sale. But it is quite hefty. And, yes, you can apply Avios points, the AARP discount and even a special Chase BA credit card discount to lower prices even more. 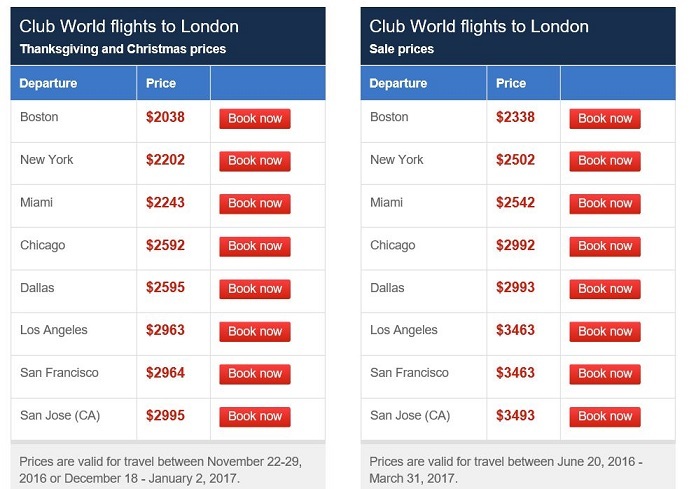 As posted today by British Airways, business class fares to London are as low as $2,038 roundtrip for Thanksgiving and end-of-year flying. First class fares during the same period are as low as $2,742 roundtrip. If you want to travel this summer--or, in fact, through March 31 next year--business class fares to London are currently running as low as $2,338 roundtrip. First class fares to London are as low as $3,042. The big catch? Tickets must be purchased by 11:59 p.m. on Thursday, May 12. The only major travel restriction: a Saturday stay is required. BA's AARP discount of $400 roundtrip is valid for this sale. But remember that extra savings is only available for travel through October 31, when the current BA-AARP partnership is scheduled to end. To claim that extra discount, you must book starting at this page. You can drive the price down still further if you use Avios points. The Avios discount (using, say, 30,000 miles for a $450 discount) does seem to come up during the booking tests I've done at BA.com. Chase-issued BA credit cards will yield another 10 percent discount when you use the code CARDOFFERU. This particular discount is not likely to work with the Avios-points-and-cash price, however. + For holiday travel, the windows are November 22 to 29 and December 18 to January 2. For the summer and onward sale, the valid travel dates are June 20 to March 31. + Only one route, BA's New York/Kennedy-London/City boutique run, is completely excluded. There are some route-specific blackout dates, but nothing terribly oppressive. They are explained in the terms and conditions on the BA promo page. One additional note: first class is not on sale between Los Angeles or San Francisco and London, although business class is available. + The deal includes flights on Aer Lingus, American, Finnair and Iberia. In other words, the Oneworld Alliance carriers. + There are similar sale prices to other European destinations, including Athens, Barcelona, Birmingham, Madrid and Manchester. That's what BA is promoting, but still other cities may be available as well. If you're interested, check because that's where some of last October's most amazing bargains were hiding. Dublin and Helsinki, to take two obvious examples, are also available on nonstops from Aer Lingus and Finnair respectively. + The applicable fare class for business class is I. For first, it is A class. + On sales of this nature, New York/Newark-to-London is where the lowest prices traditionally have been. (That's because of the huge number of seats between the two markets.) Not this time, however. The entry-level prices are being offered from Boston, where prices to London are a few hundred dollars less than from the New York Metro area. Prices are about $500 more from mid-country markets such as Dallas/Fort Worth and Chicago/O'Hare. Prices from West Coast markets start at about $2,960 (San Francisco or Los Angeles to London for Thanksgiving). + Availability is, generally speaking, quite good in business class. It's sparser in first class, but there is ample availability if you are a bit flexible on days. United Airlines, Air Canada and other members of the Star Alliance have matched the BA/Oneworld flash sale for first and business class travel. The Star Alliance matching seems to have happened overnight because I checked last evening and there was no fare movement. Except for a lack of seats in June, it does seem like the Star carriers have now duplicated the Thanksgiving and year-end prices as well as the wider sale for travel between early July and late March. I'm not seeing every route or every day, but if your preference is to do Europe with Star carriers, search now. And notable is the Air New Zealand pricing on its "hidden" LAX-Heathrow run: $2,995 for the Thanksgiving and end-of-year travel windows. ... Interested in SkyTeam (Delta, Air France/KLM)? There is sporadic matching fare activity. Delta Air Lines, for example, is matching to London from some gateways. But Air France is not on flights to Paris. However, it is promoting phenomenal first class prices to Paris from Washington/Dulles ($2,912 roundtrip). As with the previous sale, it's the hidden--in other words, unadvertised--bargains that are most interesting. 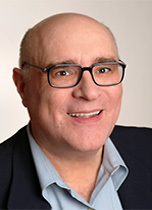 ... A JoeSentMe member reports he scored a $2,222 roundtrip ticket from Newark to Rome. That includes a BA first class seat to Heathrow and BA's business class from Heathrow to Rome. ... Another JoeSentMe member reports that the same fares have been loaded onto the AA.com Web site. That means you can use your systemwide upgrades to move into first from a business class fare. ... Two members report they scored $4,000 or below roundtrips in first class to Paris from the West Coast. One booked United Airlines nonstop from San Francisco. Another booked British Airways in first nonstop from LAX to Heathrow and then onward in BA business class to Paris/CDG. ... A pre-Christmas business class getaway to Rome? One member reports a $2,200 roundtrip fare using Air Canada outbound and Lufthansa inbound from New York. The same reader reports scoring a United/Lufthansa business class combo to Madrid in January for $2,150 roundtrip.